I am addicted to making "knick knack" boxes. These boxes holding everything from paper napkins in my kichen to assorted sewing supplies in my studio. They are also the perfect way to explore different crafting supplies. Wood box - 7" x 7" x 3"
Take off the hinges and the closure on the box with the screwdriver. Set these parts to the side. HINT: I put them in an envelope to prevent losing them. Tiny screws have way of disappearing in one's studio. Lightly sand the wood, removing any rough bits. Don't sand it so much that you end up with rounded edges! 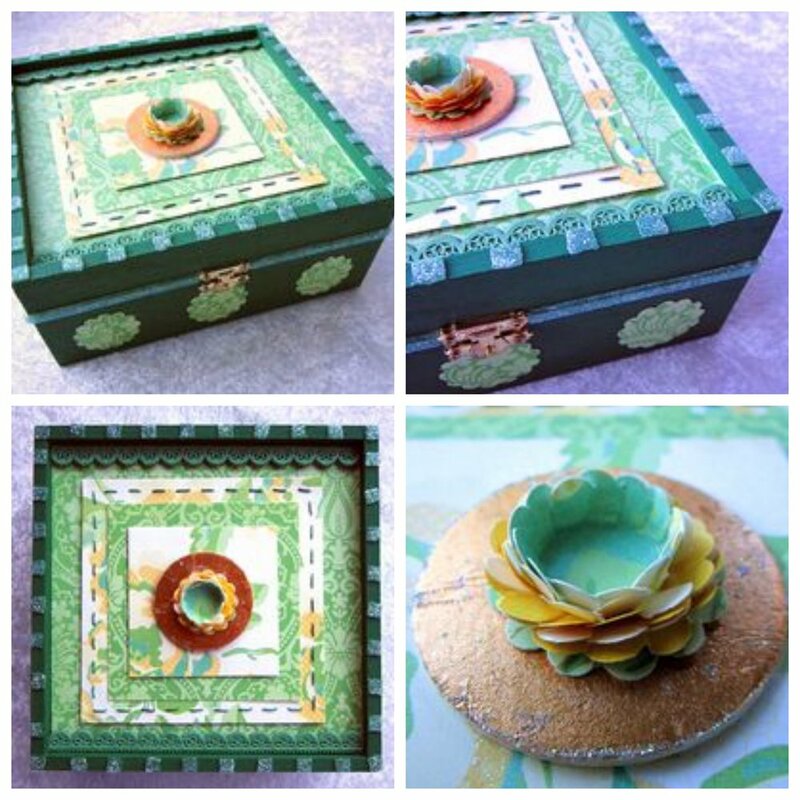 Paint the entire box with the craft acrylic paint using the sponge brush. Do two coats allowing the paint to dry in between layer of paint. Measure the top of your lid. My box (from Darice) has a 6.5" interior. Cut your paper into 4 squares using your paper trimmer (or use a ruler and pencil to measure and mark on the back and then use scissors). You need a 6.5", 5.5", 4.5" and 3.5" square. I used two papers, alternating between them. If you haven't used the Kool Tak™ Layer Perfect Tool, checkout this great video before proceeding! Using your Kool Tak™ Layer Perfect Tool, mark the stitch holes on the 5.5" paper piercing as you go. HINT: I put a piece of old cardboard underneath as I pierced to protect my worktable. Cut a 24" piece of the perle cotton embroidery thread and thread your needle. 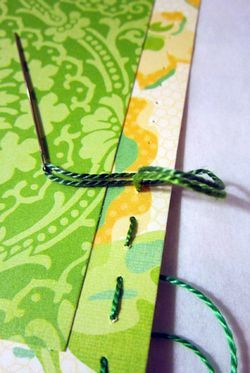 Embroider a running stitch around the edge of your 5.5" paper. Finish off with a knot on the back. Use your Kool Tak™ Layer Perfect Tool to center the 3.5" square onto the 4.5" square. Tear off a piece of the Kool Tak™ Premium EXTREME tape - 2 ½ x 27 yards and place it on the back of the 3.5" square. 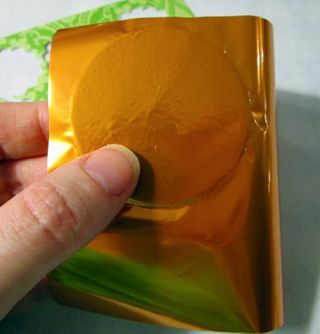 Peel off the paper backing and stick the smaller square to the larger square. Center the 5.5" square within the 6.5" square. Place 4 squares of Kool Tak™ Clear Foam pads in each corner of the 5.5" square, remove the backing and stick to the 6.5" square. Place your layered squares to the side. Carefully peel off the foil. Use your finger nail to distress the surface a bit and shake some glitter on top. It will stick to the distressed areas. Brush off any excess. Center the circle within the the top square (the 3.5" one) using the Kool Tak™ Layer Perfect Tool Add some Kool Tak™ Premium EXTREME tape to the back of the circle, remove the paper backing and firmly press int place. Set the layers to the side. Using the Kool Tak™ Layer Perfect Tool, place ten squares of Kool Tak™ Clear Foam pads - ¼ x ¼ x 1/32” thick along the top edge of your lid spacing them evenly as you go. HINT: It is easiest to place the squares at the corners and center and then the others to insure that they are evenly spaced apart. Proceed to add squares on the remaining 3 sides of the lid. Remove the backing of the squares and sprinkle fine glitter along them. Brush off any excess glitter. (I removed the paper featured in the above photo from the lid before I shook on my glitter.) I love how the glitter on the foam squares looks like mini pieces of glass mosaic! 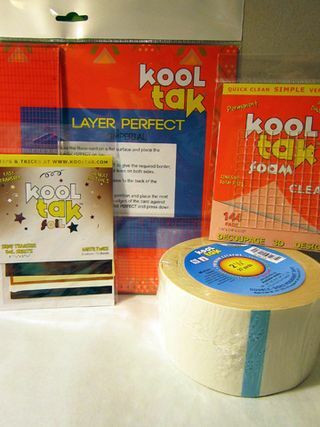 Press a line of the Kool Tak™ Clear Foam tape - 3/16 x 1/16 thick by 1.6 yards along the lower rim of the lid. Don't cover the holes for the closure or the area for the hinges! Remove the backing and sprinkle the same glitter you just used. Proceed to now put your layered squares / wood circle onto the lid. The Kool Tak™ Premium EXTREME tape is fabuously sticky, yet easy to tear. I tore off large pieces, removed the paper backings and then tore off smaller bits to get into the corners. Place your layered squares /wood circle onto the lid and press firmly. I have to admit, having never used Kool Tak™ Premium EXTREME tape until making this project, I love how it sticks to both paper AND wood. 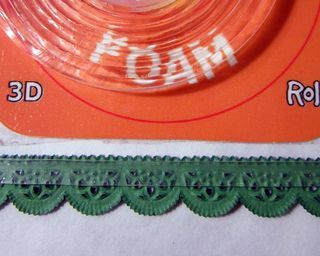 Measure two 6.5" x 1/2" pieces of paper lace or trim. Cut two 6.5" pieces of the Kool Tak™ Clear Foam tape - 3/16 x 1/16 thick by 1.6 yards and press along the lower edge of the trim. Remove the backing and press firmly into place along the top and lower edge of the 6.5" square. To make stickers to embellish the sides of your box take one of your papers and add rows of the Kool Tak™ Premium EXTREME tape to back. Punch 12 scalloped circles out of the paper with the Kool Tak™ Premium EXTREME tape backing using your 1" scalloped circle paper punch. Turn your box to the side. Using the Kool Tak™ Layer Perfect Tool center three of the scalloped circles. Remove the paper backing from the punches and firmly press into place. Proceed to do the same on the other three sides. Screw the hinges and closure back into place. 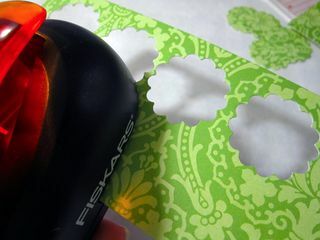 For the final touch, punch 7 scalloped circles from assorted matching papers. Layer the scalloped circles ontop of each other, sticking them in place with small bits of the Kool Tak™ Premium EXTREME tape. Cut small notches into the circle at each scallop edge. Fold each petal forward. Add a small bit of Kool Tak™ Premium EXTREME tape to the center of the back, remove the backing and place it on your copper circle. Use the Kool Tak™ Layer Perfect Tool to center it. And voila! You have a new box, all glittery and beautiful, to store your favorite treasures. Kool Tak supplied the materials used in this project.